Aparna Sreenivasan is a student in the science communication program at the University of California at Santa Cruz. She also holds a doctorate in molecular, cellular, and developmental biology. As a member of the National Science Foundation's Southern Ocean Global Ecosystems Dynamics (SO GLOBEC) research cruise to Antarctic Peninsula, she is filing periodic reports on the progress of the survey from the NSF research vessel Nathaniel B. Palmer. 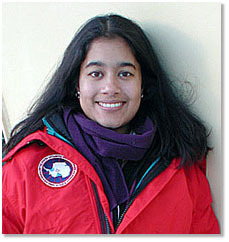 Aparna Sreenivasan aboard the NSF research vessel, the Nathaniel B. Palmer. Any opinions, findings, conclusions, or recommendations expressed in this report are those of the author, and do not necessarily represent the official views, opinions, or policy of the National Science Foundation. The National Science Foundation (NSF) vessels Laurence M. Gould and Nathaniel B. Palmer, have left Punta Arenas, Chile, to embark on a unprecedented six-week long cruise to conduct one of the most comprehensive explorations ever undertaken of the Southern Ocean, the sea that surrounds Antarctica. The research is part of the broader U.S. GLOBEC program, which studies how climate affects marine life. This season's Southern Ocean GLOBEC (SO GLOBEC) cruises are the first of many that will attempt to understand the complex interrelationships between plants and animals in the largely unexplored Southern Ocean. 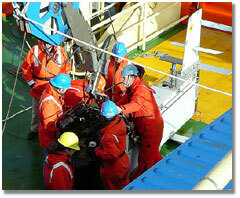 The ships will focus their research on Marguerite Bay on the northwestern side of the Antarctic Peninsula. The Gould, the smaller of the two ships, will travel to five stations in the bay, remaining at each station for five days while the researchers collect and process specific oceanographic data. The Palmer will survey a wide swath of the bay by following a distinct collection pattern, called a transect, continuously for 42 days. The floating laboratories are taking what a "bottom-to-top" approach to their research. At the ocean bottom are the nutrient concentrations, water movements and plankton, which in turn feed the larger animals at the top. Cumulatively, the studies will produce a comprehensive look at how life is sustained in the Southern Ocean. Ari Friedlender, a graduate student from Duke University who is sailing on the Palmer, noted that the advantage of multiple, simultaneous data collections is that the observations complement each other. "Actually looking at the things on top (like whales) can be a good indication of what is on the bottom," he noted. Friedlender is counting the number of whales that live in Marguerite Bay during the winter. He expects to see Minkes, Orcas, and possibly Humpbacks. The multi-disciplinary science teams will each conduct a wide range of experiments, from examining the concentration of nutrients and salt in the water to what learning what penguins eat during the winter months. Researcher Joseph Torres of the University of South Florida, the chief scientist aboard the Gould, is leading a group that will study the distribution and abundance of tiny shrimp-like creatures called krill. Scott Gallager, a researcher from the Wood's Hole Oceanographic Institution, noted that the seemingly insignificant krill are the base of the immensely productive Antarctic food chain. A type of plankton, krill live in the surface waters of the ocean and are the primary food source for larger predators like penguins, seals, and whales. Populations of krill have been previously observed in Marguerite Bay during the winter months, suggesting this would be a productive location for these extensive studies. Jennifer Burns, a graduate student from the University of California at Santa Cruz, meanwhile, will tag Crabeater seals to follow their migration and feeding patterns through Marguerite Bay and possibly farther along the peninsula. Her work complements the krill studies, because Crabeater seals feed on krill, using special sieve-like teeth to filter the tiny animals out of the water. If krill and other plankton were not available, the seals would have to move to an area where food is more abundant. Other scientists on board the Gould will study bacteria that live in extremely cold environments, and collect samples of various microorganisms to study in laboratories back in the United States. Some researchers, meanwhile, will be counting the number and types of whales in the Southern Ocean while others will conduct similar studies with penguins and other seabirds. In addition to counting species of whales, Friedlender will also take samples of the whale blubber and skin to send to the Southwest Fisheries center in La Jolla California. Contaminants are stored in whale blubber, and since the Antarctic waters are still the most pristine in the world, samples from whales in this region will be compared to whale blubber in more polluted waters. The fisheries center will also perform genetic testing on the whale skin to add to a growing database characterizing the many different whale types in the world's ocean waters. Like the Gould, much of the research on the Palmer will focus on the number and amount of krill in the waters. Hand-in-hand with the krill studies, scientists from the University of South Florida will analyze the levels of nutrients found in the water. A group from Old Dominion University in Virginia will map the contours of the seafloor by looking at the depth and circulation of the waters in the bay. In addition, they will characterize the winter ocean currents, which are important because krill use those water patterns to move around as well as gather nutrients for feeding. A parallel study at the same time next year will be used as a comparison to generate a model of the ocean water currents in Marguerite Bay. The Gould left the port at Punta Arenas, Chile on Friday April 20. Although the crew had planned to deploy earlier that day, last-minute equipment problems delayed the departure. As members of the Palmer expedition watched and waved, the Gould left port with the Chilean and U.S. flags flying. Once the ship disappeared over the horizon, the Palmer scientists continued with their own preparations. After dealing with last-minute equipment problems of their own, the Palmer sailed on April 24. "A cruise is like a canvas that is in the process of being painted," noted Torres, of the University of South Florida. " It is a work in progress." Excitement mounted as the Palmer moved toward its destination. The ship will reach the Antarctic Peninsula after three to five days at sea, and will rendezvous with the Gould soon after. All aboard are busy building up their sea legs, and hoping for a smooth ride through the Drake Passage, some of the wildest waters in the world. Spirits were high as the Nathaniel B. Palmer reached the National Science Foundation's Palmer Station on the Antarctic Peninsula. Blue-white snow surrounded the ship as it moored in a tiny inlet called Arthur Harbor, adjacent to the station. A Minke whale, the smallest species of the toothless baleen whales, slowly raised itself out of the water. Fur seals basked on the snow-covered slopes as the sun rose pouring lavender rays over the hills of ice. And tiny Adelie penguins waddled on a small ice island nearby. "It's hard to look at for too long," said Catherine Burchok, a graduate student from Penn State University who is studying whale sound patterns. "It's overwhelming". The rendezvous at Palmer Station, one of three stations NSF maintains year-round in Antarctica, was arranged to transfer supplies among the research station, the Palmer and its companion vessel, the Laurence M. Gould. The Gould had already been at Palmer Station for three days, and was preparing to leave for the Antarctic Peninsula in a matter of hours. Soon after the supplies were dropped off, the Palmer began steaming toward Marguerite Bay, the site of the Southern Ocean Global Ecosystems Dynamics (SO GLOBEC) research. The mountainous ice that surrounds Palmer Station shrank in the distance as the ship left Arthur Harbor. Three humpback whales showed off their flukes and spouted in the distance, while seals danced and played in the waves. For the remainder of the SO GLOBEC cruise, the Palmer will move through Marguerite Bay in a zig-zag pattern between 82 discrete points. At each point, or station, water samples for various experiments will be collected and bird and whale observations will be catalogued. The individual stations are 10 to 40 kilometers (6.2 to 24.8 miles) distant from each other. Researchers aboard the Palmer hope to use what they learn about the water and its inhabitants to generate a three-dimensional map of Southern Ocean, the largely unexplored sea that encircles the Antarctic continent. The remoteness of the Southern Ocean requires scientists to address some extremely basic questions about Antarctic waters. Does the Southern Ocean, for example, have a higher salt concentration than other waters? What is the average temperature? And at what level are nutrients available for ocean animals and plants during the Antarctic winter? Eileen Hofmann, of Virginia's Old Dominion University, is heading a group that is using a device called a Conductivity Temperature Depth instrument (CTD) to take water samples. CTD's are a classic physical oceanography instrument, said Hofmann, which most oceanographers have probably used during their careers. The CTD is 1.8 meters (six feet) high and just under a meter (three feet) wide, with 21 collection bottles arranged in a rosette pattern around a circular skeleton. Each bottle holds up to 10 liters (2.6 gallons) of seawater. The instrument is attached to an intricate cable and pulley system and is kept at the stern of the ship in an area called the Baltic Room. 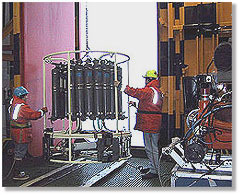 When CTD is to be deployed, a large door is slowly opened and the instrument is lowered into the water. Since this is late fall in the Antarctic, the size and power of the sea is unpredictable. Huge waves often fly through the door and crash into the Baltic Room showering the marine technicians and graduate students with icy water. But the people in the room don't mind getting wet, because the view from the open door is extraordinary. Fat, round cumulous clouds hang beneath the sun and watch over the rolling waves; while tiny Cape Petrels, seabirds indigenous to the Southern Ocean, effortlessly skim the tips of the waves. The little black and white birds don't seem to mind whether there are big or small waves, they continued to fly vigorously even when a surprise snow squall hit the ship. To get an idea of the various water properties at each station, Hofmann's group first lowers the CTD to the ocean floor. As it is lowered, a number of different graphs are plotted on a computer screen, using data collected by the CTD. The lines on the graphs correspond to temperature, salt concentration, oxygen and depth. In a matter of minutes, by looking at the graphs, Hofmann can determine where in the water column to take the necessary samples. A sudden temperature change 300 meters (984 feet) down indicates that different water temperatures above and below that temperature shift are causing sections of the ocean to mix. This mixing could mean that nutrients are being exchanged between different depths of water. These kinds of nutrient exchanges affect both plant and animal life under the ocean. Hofmann maps out the collection points and calls to bring the CTD slowly back up to the surface. To take a sample, the CTD's ascent is paused so that Hoffman can trigger the cap on one of the bottles to snap shut with a single keystroke. As soon as the water-filled CTD is brought back onto the ship, various groups hurry to get samples back to their laboratories. Chemists like Howard Rutherford and Rebecca Conroy, from the University of South Florida, take samples to check the nutrient content. Hofmann's group is eager to check oxygen levels; they are also interested in looking at how many green plants are in the water. This plant distribution is measured by filtering large amounts of the water from different ocean depths through a filter the size of a quarter. Water flows through the filter, but chlorophyll, an indicator of green plants that require sunlight, remains stuck to the membrane. By looking at the amount of chlorophyll, Hofmann's group can begin to estimate how many plants live in the Southern Ocean. Similar to the equatorial oceans, the water in the Antarctic is thought to be high in nutrients, but low in chlorophyll, said Hofmann. But the actual concentration of plant life in the Southern Ocean is much less than the theoretical maximum. The Southern Ocean, in short, is behaving like a well-fertilized lawn that refuses to grow. Scientists' studying equatorial oceans found that iron levels there were extremely low, and lack of that essential mineral prevented large-scale growth of green plants. Researchers believe a missing essential nutrient could also be restricting the abundance of green plants in the Southern Ocean. SO GLOBEC is the first attempt ever to study the Antarctic water column in such detail. Wendy Kozlowski, a biologist from Scripps Institution of Oceanography in La Jolla, California, said that understanding the properties of the Antarctic waters is important, because these waters feed into the rest of the Earth's marine ecosystems. How the water behaves in Antarctica could affect people all over the world. Much of the Palmer's research over the next month is to map uncharted scientific territory, and the scientists aboard the ship are excited about what might turn up in these investigations into the ice-cold mysteries of the Southern Ocean. During the past week, the Palmer has battled turbulent seas, ice-cold temperatures, and strong winds while cruising to its scientific sampling stations in Marguerite Bay on the Antarctic Peninsula. But the harsh conditions have not stopped researchers from working around the clock to gather data. As the ship moves southward, sea ice will get thicker. The Palmer is an ice-breaking vessel and should have no problem cutting a swath through the thick ice. But along with the freezing water come increased swells and more brutal storms. In as few as 24 hours, the weather can change from a "balmy" minus two degrees Celsius (28.4 degrees Farenheit) with breezes of two to five knots (2.3 to 5.75 mph), to extremely stormy seas with winds of 40 to 50 knots (46 to 57 mph). Indeed, earlier storms the Palmer encountered seem placid when compared to the large storms the ship has recently faced. One packed 35- to 40-knot winds and waves greater than 6.9 meters (20 feet). The Palmer's skilled and experienced crew, headed by Captain Michael Watson, has had no significant problems navigating through the rough weather, though caution is the watchword. "You just can't go to fast in storms like these," said Watson. "You've got to take your time." The ship is currently at station 61 out of 84 in its scientific survey pattern, and is heading southwest. Since the beginning of the trip, almost three weeks ago, the number of daylight hours has dwindled from nine to a mere five-and-a- half. Generally, the sun rises at 10:45 a.m., but to be seen it first has to make its way through heavy gray clouds that hang over the horizon. By 3:30 p.m., the sky is dark. "I miss the sun," said Susan Howard, a researcher from the Earth and Space Research Institute in Seattle, Washington. Howard is working with a sensor called the Acoustic Doppler Current Profiler (ADCP) that measures how water circulates in the ocean. The profiler is mounted to the ship's hull and takes direct measurements of the ocean currents -- day and night -- as the vessel moves. Howard hopes to generate a map of how the currents circulate through Marguerite Bay. This is important, she says, because no one has ever taken such measurements this far south. Knowing how the water moves throughout the bay will help researchers understand how the small plants (phytoplankton) and animals (zooplankton) are moved between the nearby waters of the continental shelf and those in the bay. As currents move through upper 200-300 meters (650 to 980 feet) of the water, they change directions, which can move the phytoplankton and zooplankton into different environments. Currents can also concentrate small zooplankton and krill into a small area where they provide a virtual pantry of food for larger animals. Profiles of the water currents also give information about the movement patterns of the sea ice, which is an important habitat for krill and their predators such as penguins and seals. Howard is collaborating with Bob Beardsley, a physical oceanographer from the Woods Hole Oceanographic Institution (WHOI), in Woods Hole, Mass., who is also aboard the Palmer. Earlier in the season, Beardsley's group put a number of semi-permanent current meters into the ocean waters at different points around Marguerite Bay. Like the ADCP, the current meters measure how the water is moving, but they do so from fixed positions. Both methods have advantages and disadvantages. The moored meters measure the ocean currents over a longer period of time, while the ADCP is limited to sampling an area only once as the ship cruises through its course. In other words, the ADCP takes measurements over a wide area while current meters provide more information over time from a fixed location. Beardsley and Howard will combine what they find individually to make an accurate map of how the water is moving through Marguerite bay. The Palmer is now deep in the heart of Marguerite Bay, and often encounters large icebergs that have broken off the ice shelves, and glaciers on the nearby islands. Often, newly forming ice surrounds the ship as it makes its way south toward the end of its transect route. Three types of sea ice, "shuga", "nilas" and "grease" ice, predominate during these early winter months. Grease ice is newly forming, blackish gray in color, and looks like foamy oil slicked over the water. Crabeater seals, which sometimes follow the ship, effortlessly swim through the slushy grease ice. 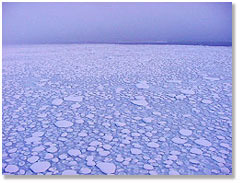 Round blocks of ice, that look like pancakes stuck together, and stronger packed ice will eventually appear. When they signed on for the trip, the researchers and crew expected to fight weather and storms, so they generally take the rough conditions in stride. Sometimes, experiments are postponed until winds and waves die down and the ship is steadier, but other times, the show goes on, with or without good weather. It is during these times that the researchers are particularly grateful for the support crew working behind the scenes. The Palmer and the Laurence M. Gould, her sister ship in this cruise, are handled by crews employed by Raytheon Polar Services Co., of Englewood, Colo., NSF's logistical contractor. Each ship has a group of computer, electrical, and marine technicians that work together to keep all aspects of the cruise running smoothly. On the current cruises, Alice Doyle is the head marine project coordinator (MPC) and has been intimately involved in the organization and implementation of the 2001 Southern Ocean GLOBEC cruises. Doyle started as a science technician on similar cruises. With a chemistry degree from the University of Virginia and more than five year's experience as a marine chemistry research technician, Doyle is able to easily trouble shoot laboratory problems. She also serves as an emergency medical technician. The Raytheon support staff are exceedingly friendly and work very hard to keep everyone happy and safe. They also enjoy their work. One late evening, in the midst of one of the most raucous storms the Palmer has encountered, researchers were poised to take water samples over the stern of the ship. This required deploying an expendable conductivity temperature depth probe (XCTD). The XCTD, like its larger counterpart, the conductivity temperature depth probe (CTD), collects information about the salt concentration, temperature and depth of the water column. But the XCTD is a far less expensive, one-time use instrument. Once deployed, the probe drops to the ocean floor, feeding data to a computer inside the ship. The expendable XCTD is used when conditions are too dangerous to deploy the larger CTD from the ship's "Baltic Room," which provides access to the open ocean. Huge walls of water flew onto the deck while technician Matt Burkeshot, an Earth Science Oceanography graduate of the California University of Pennsylvania and a veteran of five years at sea, deployed the probe. After the XCTD safely on its way, Burke made his way back to shelter. Smiling, he said that it is this kind of days that keep him coming back to sea. As the Nathaniel B. Palmer reached the end of its survey grid, the researchers and crew breathed a sigh of relief and patted each other on the back for a job well done. For almost 40 percent of the transect, they dealt with less-than-desirable weather conditions, and nonetheless managed to successfully collect large amounts of data, said Peter Wiebe, chief scientist for the Palmer. Wiebe was pleased with the cumulative efforts of the biological oceanography group from the Woods Hole Oceanographic Institution (WHOI). Wiebe and three other WHOI scientists, Carin Ashjian, Cabell Davis and Scott Gallager, are working together to characterize the distribution and abundance of tiny ocean animals called zooplankton and their plant counterparts, phytoplankton, in Marguerite Bay. Phytoplankton are microscopic plants at the base of the food chain. Zooplankton, such as the small shrimp-like animals called krill, eat phytoplankton. The oceanic flora and fauna, in turn, are the food for many of the Antarctic animals including penguins, seals, and whales. 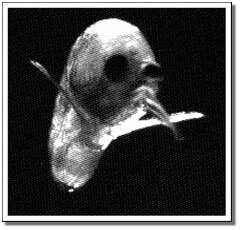 A krill caught on digital video as it tries to escape from the video plankton recorder's field of view. The organism is one centimeter (.39 inches) in diameter. "We are using a holistic approach to determine when, where, and to what extent patches of Antarctic krill and other plankton organisms co-exist with marine mammals," Wiebe said. During the cruise, Wiebe's group has found a number of "hotspots", large Antarctic krill patches, in Marguerite Bay. Some of the patches are up to 80 meters (262 feet) thick, and have been strongly correlated with marine mammal sightings and recordings of whale vocalizations. Antarctic krill and other zooplankton are known to form large aggregations, but when and where these concentrated patches occur is not well understood. The Woods Hole group found that the smaller, larval Antarctic krill are present in substantial numbers over most of the continental shelf in the Southern Ocean Global Ecosystems Dynamics (SO GLOBEC) survey area. On the other hand, the adult animals are more concentrated along the inner regions of Marguerite Bay and tend to associate with the coastal water currents. Using an instrument called a BIo-Optical Multi-frequency Acoustical and Physical Environmental Recorder (BIOMAPER) the Woods Hole group has been using acoustic sampling techniques to survey the distribution of krill, zooplankton, and fish in the winter ocean waters of the Western Antarctic Peninsula. Acoustics is a non-invasive and expansive technique. In other words, it allows researchers study animals without having to take them out of their habitat, or kill them for study. The instrument uses sound to determine the presence of organisms in the water column. Sound travels easily and quickly through water, just as light travels through air. The noon to four PM shift works to get BIOMAPER ready for its next run. Alice Doyle, and Joe Warren. BIOMAPER II works by first sending a "ping" from an underwater loudspeaker called a transducer. The ping passes through the water until it reaches an organism or a group of organisms. The sound then reflects off the targets, and bounces back to a receiver on BIOMAPER II. How quickly the echo returns, and the intensity of the sound waves, tell researchers the size and location of the organisms in the water. Sound waves expand outward as they travel through water. 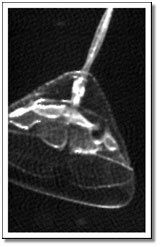 This sound spreading allows researchers to sample large volume water quickly because when the "ping" is released from the transducer, it extends out in a cone-shaped pattern. The farther away the ping gets, the greater the volume of water sampled. Therefore, a huge volume of water can be examined without physically taking any of the animals out of the ocean. One difficulty with the way BIOMAPER II works is that the instrument alone can only measure the sound reflected off the animals. This acoustical data shows the scientists roughly how many organisms are present, but does not reveal the identity of the organisms with certainty. One adult krill may look the same as five juveniles of the same species by the way they scatter the sound waves. Therefore, the Woods Hole group would like to understand if specific organisms scatter sound in an identifiable, consistent pattern. To do this, they need to know how different animals reflect sound. To get closer to the answers, they are using a combination of techniques that includes theoretical mathematical models, observing the organisms in the water column in real time, and collecting live animals from periodic net tows to physically identify the flora and fauna in the areas measured by BIOMAPER II. Biomaper II hangs from a number of cables as it is brought on board after its run. BIOMAPER II is a unique biological sampling instrument, in part because it uses both sound and visual recordings to distinguish what is living in the water column. Wiebe, and his co-worker Tim Stanton, originated the idea for the BIOMAPER in the mid-1990s. On this Antarctic expedition Wiebe is using BIOMAPER II, a second-generation instrument. Before their invention, researchers who used acoustics techniques rarely looked at the animals at the same time they were taking sound data. Although occasionally, someone would drop a net into the water, Wiebe noted that the composition of the water column can change so rapidly that if the biological sample is not taken at the exact moment the acoustics data are recorded, researchers cannot be sure that the animals pulled out of the net are representative of what is reflecting the sound underwater. Also, other sound-based studies only sampled the sea surface from a fixed, downward-looking position. 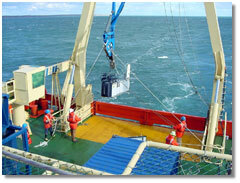 In contrast, BIOMAPER II is brought down close to the ocean floor and back up again. This method, called "towyoing," allows sampling of the entire water column -- from the surface to great depths -- rather than the surface layer alone. "The problem with most oceanography sampling methods, is that you get a point measurement, and that doesn't give you a good idea of what is happening over a broad area," said Joe Warren, a Woods Hole post-doctoral fellow who writes computer programs to analyze the data collected by BIOMAPER II. The older methods did not satisfy Wiebe and Stanton who wanted to understand marine zooplankton within a larger context. So they put together BIOMAPER. The instrument looks like a tiny airplane without wings. It is rectangular, 3.6 meters (12 feet) long and .9 meters (three feet) wide. The machine's body is white with a black "nose" and has a number of devices attached to the sides. Fastened to the front is a "video plankton recorder" (VPR) with two high-resolution cameras. Researchers Cabell Davis and Scott Gallager invented the VPR to observe how, in real-time, different types of plankton are distributed. The VPR cameras take 60 images per second and transfer the pictures to computers on board the ship while BIOMAPER II towyos under water. When the VPR goes through a huge patch of animals and plants, 3600 images per minute are transferred to the computer, which then sorts the organisms by their identities. (.59 inches) centimeters in diameter. For example, all of the shrimp-like Antarctic krill are put into one computer file, while all copepods (tiny zooplankton animals) are sorted into another file. In this way, Gallager and Davis can easily count how many of each type of organism are present in the patch, and knowing the towyo pattern, can calculate the number of animals per cubic meter of water. BIOMAPER II also incorporates an Environmental Sensor System, which includes temperature, salt concentration, and fluorescence sensors, and is similar to a small Conductivity, Temperature, Depth (CTD) instrument. By using the environmental sensor system, the researchers know several of the properties of the water column as they bring BIOMAPER through it. These experiments answer questions like : What organisms are in the water column. At what depth? How cold is the water where these specific organisms live? What proportion of the organisms in the water column use light as their energy source? Wiebe said that his instrument is constantly evolving. As the end of the cruise approaches he is satisfied with the data that he and his collaborators on board the RVIB NB Palmer have acquired using BIOMAPER II. The team would eventually like to understand the role of marine zooplankton in Antarctica and the potential for Antarctic krill to provide a seed population for other krill species around the frozen continent, he said. "We don't know why they (the Antarctic krill) are in one place but not in another," Wiebe said. But in the coming months, on future SO GLOBEC cruises, he hopes to acquire more data to answer those questions.